ANÚ Community Healthcare Ireland Directors, Gina and Margaret are the sole authorised trainers for The DECIDER Skills Workshop in Ireland. One of the great challenges facing clinicians in mental health and teachers within schools is dealing with adults and children who have difficulty managing their emotions. The unhelpful and often destructive behaviours that are a consequence of poorly modulated emotions leads to much pain, suffering and disruption to the lives of many people. 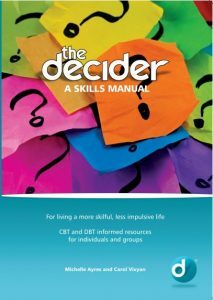 The DECIDER workshop are a fun memorable skills based interactive means to empower and equip clinicians and teachers with skills and information that will enhance clinical and teaching practice. These skills can be taught to students and people with mental health difficulties in an effective and fun way. To use at home, in education, in the workplace, and in social and healthcare settings. The aim of the two day workshop is to train health professionals, social care professionals and support professionals, using The Decider to help people to deal with impulsive behaviours such as: self harm, avoidance, withdrawal and isolation, aggression, substance misuse and binge eating. These behaviours are often associated with anxiety, depression, anger, addictions, eating disorders and personality disorders and can have devastating consequences. The aim of the one day workshop is to train teachers and social/health/support professionals to help people understand and manage their own emotional and mental health and wellbeing.